Yes, it’s true. Another pumpkin recipe. I told you guys that I love pumpkin season. Who doesn’t? 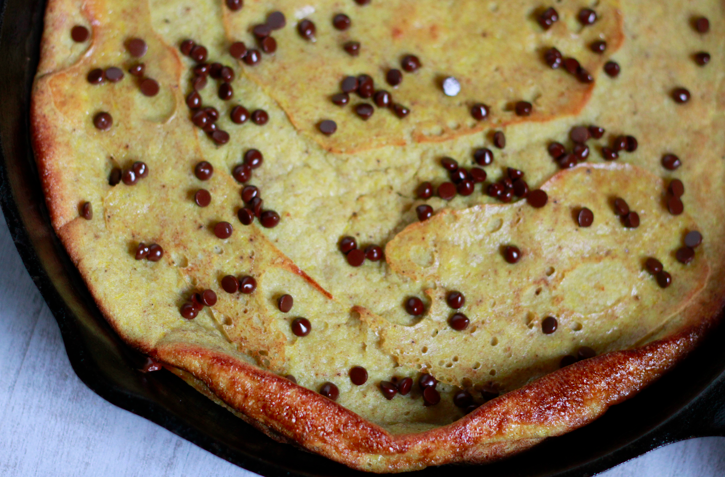 Today’s tribute to the amazing pumpkin is : Pumpkin Spice Dutch Baby. Coming from a Finnish family, I loved these super easy dutch baby creations growing up. Seeing that puffy pancake come out of the oven and then watching it slowly sink into itself was so impressive to me. These adorable babies evoke memories of family and warmth for me. This is my grain-free version of an old childhood favorite with a little fall time spice added to it. 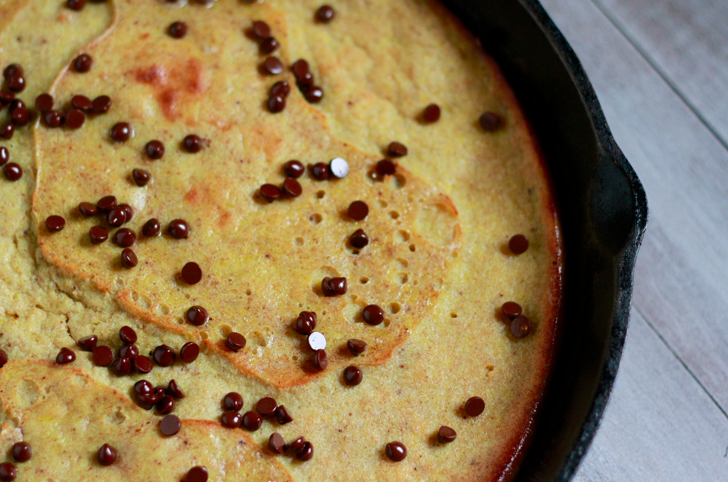 The secret to the perfect dutch baby is a hot skillet. Cast iron is perfect for this. Put the skillet in the oven while it’s heating so that the pan is hot by the time you’re ready to cook. This will ensure that your “pancake” cooks just right, crispy on the edges and “pancakey” in the center. Topped with a little REAL maple syrup, warm fruit, or whipped cream, this fall time delicacy will surely warm your kitchen and your heart. Maybe even becoming a new family tradition. Preheat oven to 450’F and place skillet into oven. Combine milk and eggs in a large bowl and whisk vigorously. Add pumpkin puree, almond flour, salt, vanilla, and spices. Mix well to thoroughly combine. Remove skillet from oven. Drop in ghee or butter and return to oven for 2-3 minutes, until completely melted. 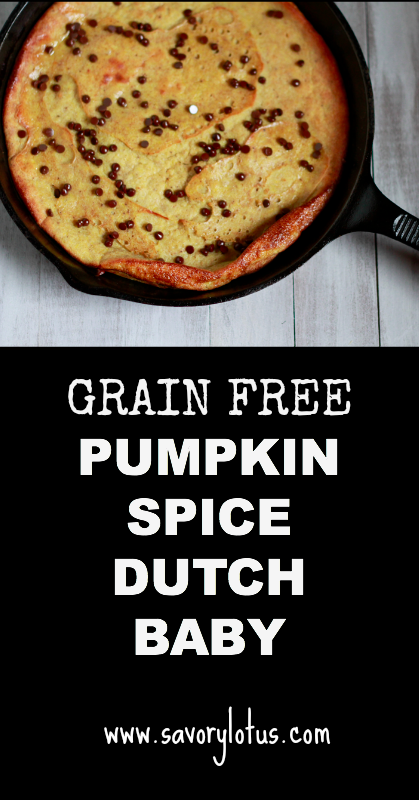 Remove skillet from oven and pour pumpkin spiced batter into skillet. Do not stir. The butter/ghee will pool on top of the batter. Place back in oven. Bake for 16-20 minutes, until turning golden brown and slightly crispy at edges. Throw a handful of chocolate chips on top and serve warm. Enjoy! What size skillet do you use? My skillet is 12 inches. I have used my other 10 inch one as well. My kids love when I make this! I bet your grandson will too! Sounds delightful! Gotta try this. Mmm, this looks wonderful! Good to know about the hot pan, too. We’re not gluten-free and we can’t do almonds at our house – do you know if this recipe could be converted to sourdough, or even just regular flour? Dutch babies are traditionally made from regular flour. So you can experiment with what you have. 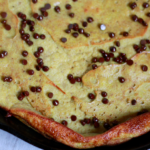 Here is one recipe made with sprouted grains to give you an idea —> http://nourishedkitchen.com/dutch-baby-pancake-recipe/ You can just add the pumpkin puree. I would love to hear how it goes. Do you happen to know the Carb Count? Made this for breakfast, OMG! So fantastic! Yay! So glad you enjoyed it. I love dutch babies. And this one is my favorite. Thanks for the kind feedback! Oh, good! I’m so glad you enjoyed it. You can make this with chopped apples as well instead of the pumpkin. I love cooking in cast iron. Looks divine! Also looks like breakfast this morning! We shared with our FB readers at homesteadlady.com. This sounds so delish. Unfortunately I cannot find canned pumkins here is Germany. Just pickled pumkins. A fresh one is way too much for me. What do you think how to substitute? Another answer: Butternut squash. A lot of canned pumpkin is really butternut anyway. Hi! This recipe looks amazing, and great for my toddlers this fall. Wondering if you could use coconut flour? I might try it out, anyone know? I can’t wait to make this! Can coconut oil be used as a substitute for the ghee? I just made this, and it is wonderful!!!!! I did use plenty of Dark Chocolate chips on it though LOL! I am new to Low Carbing and grain free eating, and this was easy and I had all the ingre here at home… My teenage son LOVED it! I did wonder if I could make it plain without the pumpkin in it? 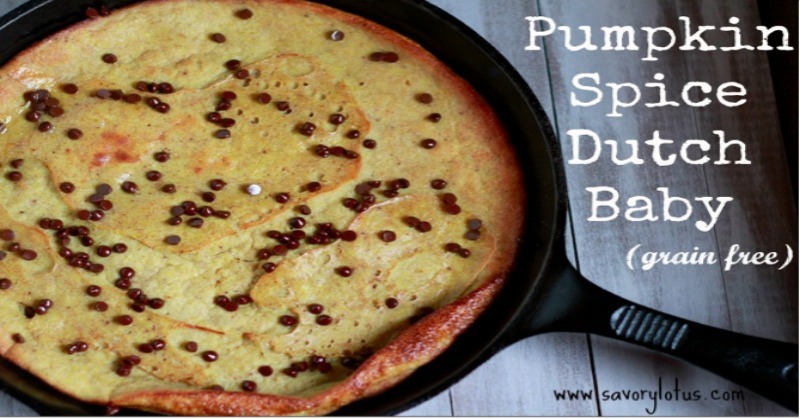 Would I need to add something to replace the pumpkin for the right texture… My son even thought that this would be good made savory to sub for cornbread…. I see many variations in our future, and I am finally going to get some good use out of my cast iron skillet. Just finished eating this,so good! Thank you for a fantastic recipe!